Founded in 2001, Catholic Telecom is a Catholic owned independent national & international solutions provider of a full array of telecommunications and other services for small, medium, and large business customers in the enterprise space. Partnering with over 100 premier US based and International carriers, wireless, energy and other providers, Catholic Telecom is able to simplify the purchase and management of your telecom and other business services providing best-in-class solutions tailored to your technological and budgetary requirements. As an independent agency, our objective is to serve you our client, not any one particular provider. Our clients include parishes, schools, seminaries / houses of formation, monasteries, retreat centers, financial institutions, medical and legal professional practices, and more. 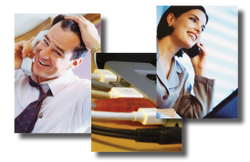 Whether a small business or a company in the large enterprise space with a telecom expense of over $100,000 per month, we can help! We welcome the opportunity to earn your business through our competitive pricing and personalized service. Please contact us at least 3 to 6 months before your contract renews to discuss your requirements. "Our law practice is located outside of the greater metro-Atlanta area yet we have several clients near the city. Catholic Telecom was able to reduce our long distance charges and provide us with toll-free service, a convenience appreciated by our clients. The money saved on our long distance fees has contributed to our bottom line. We highly recommend Catholic Telecom"